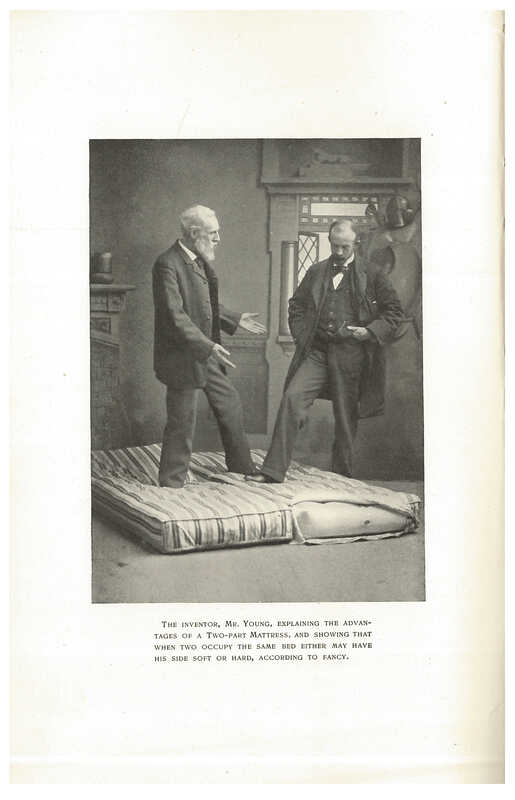 Would it surprise you to know that air mattresses existed in the nineteenth century? 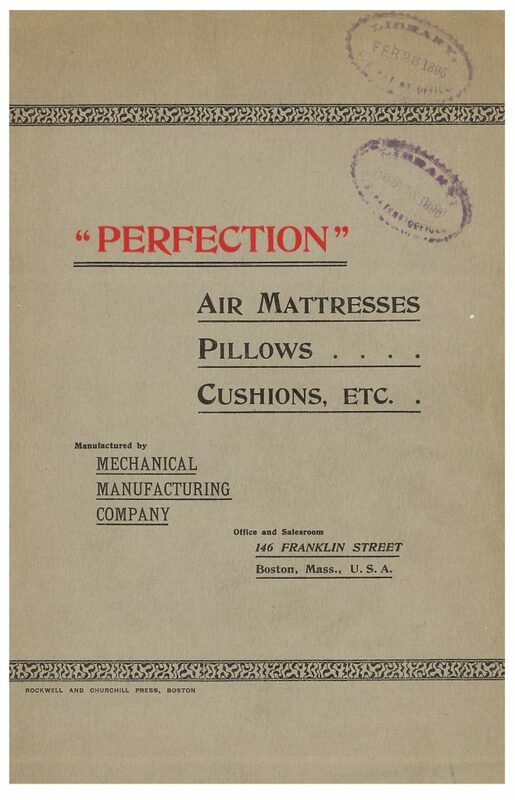 That thought never occurred to me until I came across this trade catalog from 1896 advertising the “Perfection” Air Mattress. The “Perfection” Air Mattress was sold by Mechanical Mfg. 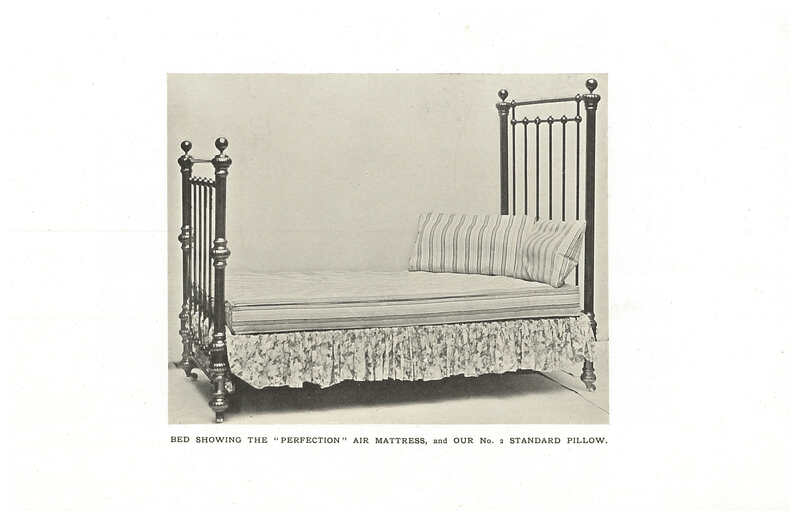 Co. and is described in their 1896 trade catalog entitled 10,000 Nights of Luxury Being a Description of the “Perfection” Air Mattresses with a Few Words about “Perfection” Pillows and Cushions. Mechanical Mfg. Co. of Boston, Massachusetts acquired the business of manufacturing air mattresses, pillows, cushions, etc. from Messrs. Alfred Hale & Co. Mechanical Mfg. Co., Boston, MA. 10,000 Nights of Luxury Being a Description of the “Perfection” Air Mattresses with a Few Words about “Perfection” Pillows and Cushions, 1896, front cover of catalog. Mechanical Mfg. Co., Boston, MA. 10,000 Nights of Luxury Being a Description of the “Perfection” Air Mattresses with a Few Words about “Perfection” Pillows and Cushions, 1896, title page of catalog. The benefits of the air mattress were described in detail in the catalog. The user decided how hard or soft to make the mattress depending on how much air was inflated in it. The mattress had an air-tight valve which allowed it to retain its shape, even after a lot of use. The cover of the mattress could be removed for cleaning when needed. The air mattress was easy to move around and lightweight. It took up very little space when not in use. For hospitals, the catalog mentions that the air mattress helps prevent bedsores. Mechanical Mfg. Co., Boston, MA. 10,000 Nights of Luxury Being a Description of the “Perfection” Air Mattresses with a Few Words about “Perfection” Pillows and Cushions, 1896, page 9, “Perfection” Air Mattress with No. 2 Standard Pillow on a bed. The mattresses were available in several sizes. The full size mattress measured six feet three inches by four feet six inches. It came in either one piece or two piece. If it was a two-part mattress, it was divided lengthwise so that each side could be inflated separately. This allowed each person to choose how hard or soft to make their side of the mattress. Mechanical Mfg. Co., Boston, MA. 10,000 Nights of Luxury Being a Description of the “Perfection” Air Mattresses with a Few Words about “Perfection” Pillows and Cushions, 1896, page 11, two-part mattress. Mechanical Mfg. Co., Boston, MA. 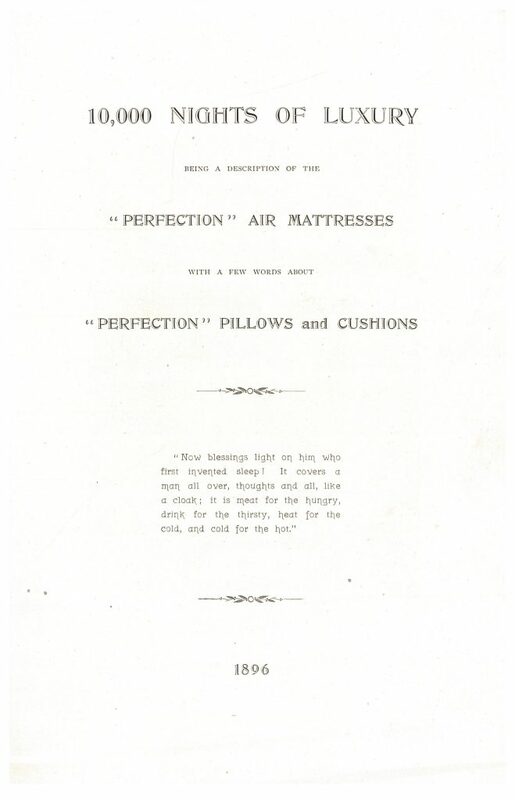 10,000 Nights of Luxury Being a Description of the “Perfection” Air Mattresses with a Few Words about “Perfection” Pillows and Cushions, 1896 showing the two-part mattress. 10,000 Nights of Luxury Being a Description of the “Perfection” Air Mattresses with a Few Words about “Perfection” Pillows and Cushions by Mechanical Mfg. Co. is located in the Trade Literature Collection at the National Museum of American History Library. I think this may be the first American use of air mattresses however they had already been present in Europe for a few decades. 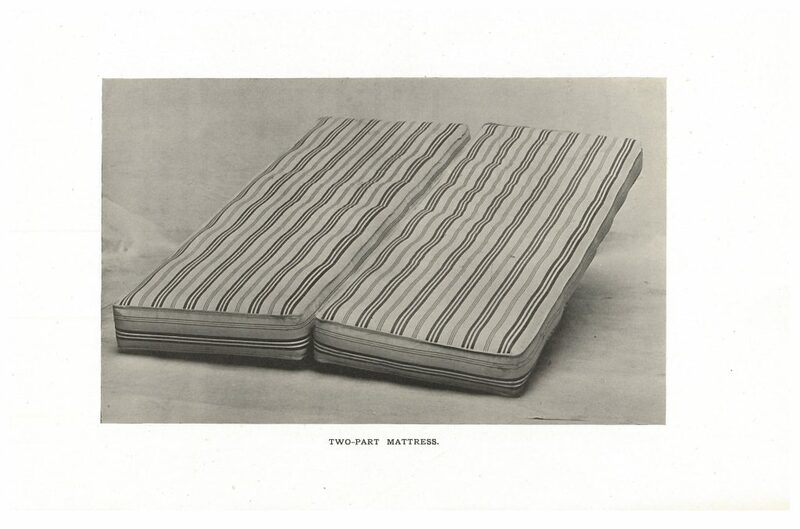 Hancock designed the first air mattresses, air cushions and air pillows in the 1820s, it can be seen in his 1857 book ‘Personal narrative of the origin and progress of the caoutchouc or india-rubber manufacture in England’.